Building owners and facility managers are discovering that Building Information Modeling (BIM) models of buildings are deep reservoirs of information that can provide valuable spatial and mechanical details on every aspect of a property. When used appropriately, this data can improve performance and save time, effort, and money in running and maintaining the building during its life cycle. It can also provide information for future modifications. For instance, a BIM could reveal everything from the manufacturer of a light fixture to its energy usage to maintenance instructions. BIM for Facility Managers explains how BIM can be linked to facility management (FM) systems to achieve very significant life-cycle advantages. It presents guidelines for using BIM in FM that have been developed by public and private owners such as the GSA. There is an extensive discussion of the legal and contractual issues involved in BIM/FM integration. It describes how COBie can be used to name, capture, and communicate FM-related data to downstream systems. There is also extensive discussion of commercial software tools that can be used to facilitate this integration. 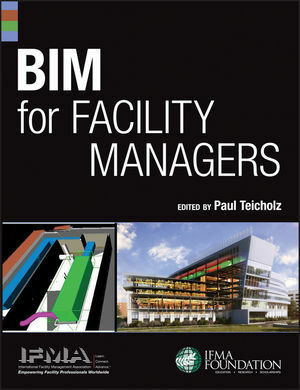 BIM for Facility Managers is an indispensable resource for facility managers, building owners, and developers alike. The International Facility Management Association (IFMA) is the world's largest and most widely recognized international association for professional facility managers, supporting more than 20,000 members in seventy-eight countries. How Does an Integrated Project Delivery (IPD) Environment Affect Liabilities Related to Reliance on BIM?